I was missing London last week. I really felt the need to go for a visit. Luckily, I had a book in my TBR pile that was waiting to take me there. While I’m not always fond of London’s continually changing cityscape, one thing I adore about London is what doesn’t change. A perfect example is the ancient building that’s tucked in among skyscrapers called the Gherkin, the Walkie-Talkie, and the Cheese Grater. In the shadow of modern architecture is a treasure that’s been around for nearly a thousand years. 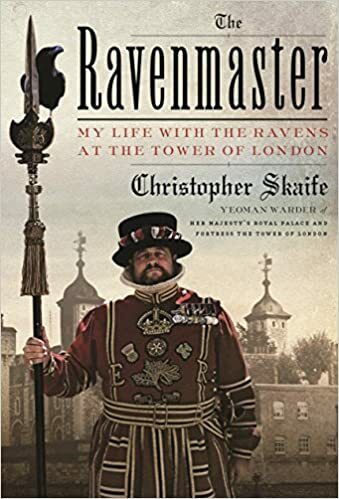 The book I referred to above is Christopher Skaife’s The Ravenmaster, which is also his job title. Skaife is a Yeoman Warder at the Tower of London and is the official Ravenmaster, keeper of the legendary ravens of the Tower. Tradition states that six ravens shall at all times live at the Tower lest the kingdom fall. That’s a big job for a half-dozen birds. No pressure, guys. Skaife is an excellent raconteur which, as a Yeoman Warder and oft-times tour guide, comes in very handy, and this book is a fun, interesting, well-structured, wholly approachable memoir of a unique life and a unique occupation. The Ravenmaster (or Raven Master) has only been a recognized post since 1969; prior to that, the duties of raven care fell to the Yeoman Quartermaster, but even that responsibility doesn’t go too far back, not officially anyway. Ravenmaster wasn’t a post Skaife sought, or even knew existed. To become a Yeoman Warder, one must first have twenty-two years unblemished military service. Skaife had that, and applied for a post at the Tower. It was only after he’d been at that job for a while that he had a second interview. With the ravens. Seven ravens currently live at the Tower, and under Skaife’s care, they live a pretty posh life. While he does trim some of their feathers to limit their flying ability, they can and certainly do fly. They can fly away at any time, actually, but safe nesting boxes, regular meals, tasty blood-soaked biscuit treats, and a never-ending stream of tourists to observe, follow, tease, and steal from has so far kept them all coming home each night. Skaife’s memoir is structured around his day as Ravenmaster, but takes us back to his childhood, to his military years, and to his apprenticeship, as well as looking forward to the future of the Tower and his beloved ravens. While he admits to being neither a scientist nor an ornithologist, the Ravenmaster is well-read on the topic of what he calls “ravenology,” and he has many years’ experience working directly with his wards. This has given him a vault of knowledge, but one he can relate without the impenetrable jargon that a more scientifically oriented writer might present. Skaife’s storytelling style is aimed at us regular folk, not for a peer-reviewed journal, and so with clear language and a lot of good humor, he guides us through his day, and through his life. Ravens are exceedingly intelligent and, as anyone who’s had a particularly smart dog or cat can tell you, that can be a problem. Intelligence begets curiosity, which begets experiment, which often begets unexpected results. Skaife has endeavored to let his ravens be ravens: he does not teach them tricks or to mimic the human voice, he encourages them to bond in pairs rather than bonding to humans, and as mentioned he takes a minimalist approach to trimming their feathers which not only keeps them healthier but keeps them safer as they are able to fly away from the foxes that prowl the grounds at night, and also glide down from heights they may have reached (the Tower is over 150 feet high in places). Sprinkled throughout the book are historical tidbits about the Tower, the ravens, and London in general, but by far the most interesting to me were his observations about the seven he cares for, their personalities, and their complex social interactions. Their moods and habits show a mirror to our own human nature. Ravens hold grudges, play tricks, grieve loss, bond tightly, and have definite individual likes and dislikes. They are fascinating creatures wreathed in myth and legend, revered and feared the world over, and Skaife shows us, through anecdote and example, why that is. After reading The Ravenmaster I feel like I’ve spent some time in the old town. Unfortunately, now I want to go back even more than I did before. GO HAWKS!! Seahawks, I mean. I presume that is why you want to go to London???? Not sure I follow. I’m not a big sports fan in any case. What are the Seahawks doing in London? Tee hee, the Seahawks are in London to play a game, strange as that seems. For about ten years now, the National Football League of the USA has been sending teams to play in London because they are planning to expand American-style football there. This is the first time that the Seahawks have gone to London. On Sunday, October 14th, the Seahawks will play a game in Wembley Stadium, against the Oakland Raiders team. Interesting. I wonder what the Brits think of it. Frankly, I didn’t even know the season had started. No, by yearning for London probably came from binge-watching a British cop show. I was surprised to learn that there is already a Seahawks UK fan club, and the whole event is a huge deal with activities scheduled for those who have come to London for the game.